I've been looking for the perfect grey for baby girl's room. I have to choose from one of these because I'm not searching anymore, darn it! I've been to Home Depot at least 4 times and to two different Ace Hardwares trying to find the right grey. And don't 3, 5, and 7 look like practically the same color? I went to the Depot twice trying to get a lighter version of number 3 and that's what I ended up with. I'm pretty sure I'm the one person in the world that would actually save money if I hired an interior designer to do this stuff for me. Anyway, do you have a favorite? I think I (finally) do but I need to sleep on it before I go buy a gallon or two. I vote 5. Decision. Made. 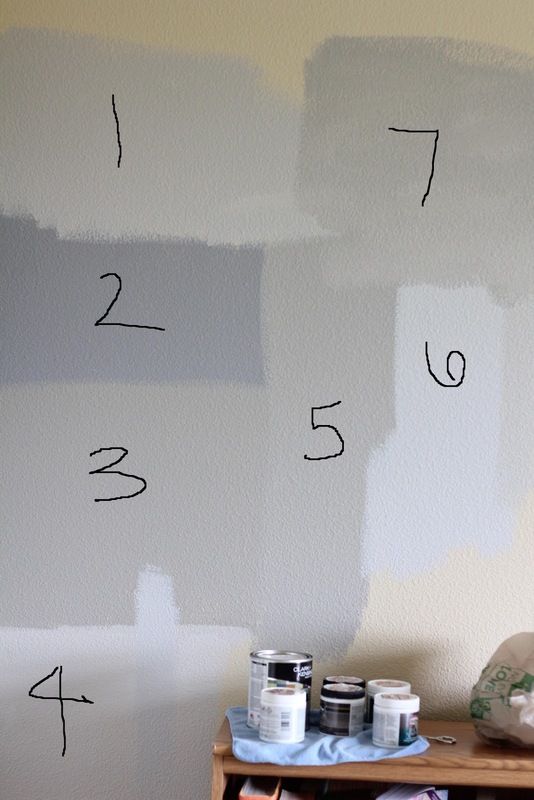 I like 4 because it's not as close to white as 6, but still obviously gray, therefore neutral. And I wouldn't go any darker than 5. Can't pick a favorite without knowing what you're doing with it. Are you by any chance doing yellow and gray? That is one of my new favorite color combos. Anyway, I'm impressed with your determination. I always just pick a color and go with it, alternating between feelings of regret and remorse as I'm painting and it's not what I imagined, and then usually deciding it's fine once I'm done! I like 5 and 7! Good luck!! Hehe, I know how painful this decision was for me. This is what 3 of our walls looked like too. I wanted to see if the color changed if I moved it around the room. I like all three of the similar shades: 3, 5 & 7. I forgot to ask, are any of these colors Nimbus? #1 kinda looks like the grey I did in our great room. But you can do a darker grey in the bedroom. Especially if it's paired with either yellow, turquoise or cream. 4 or 6. Lighter the better. But then I'm a fan of white walls. I think you need to hold another object (one that will also be in the room or part of the overall design) up against the grey and take another photo.